You only have one month left until Halloween — have you found the perfect costume for yourself yet? If you haven’t, there’s no need to be afraid. 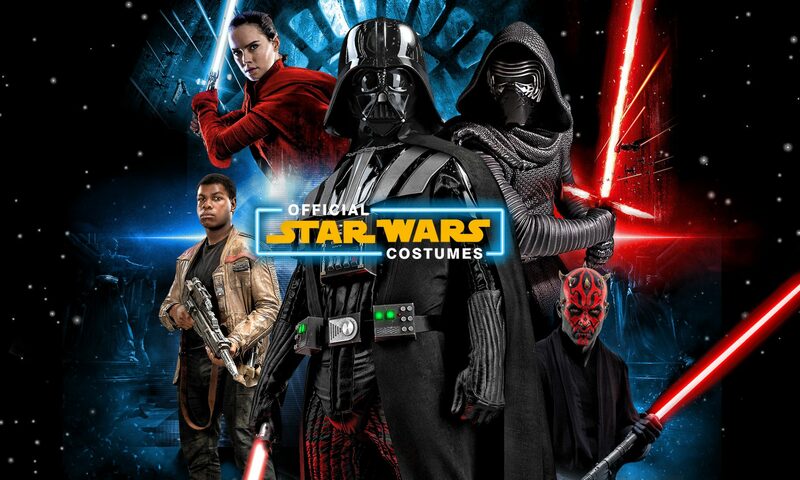 Here we will list five of the most popular Star Wars costumes for 2016 so far. To no one’s surprise, Rey is one of the most popular characters this Halloween. As the first of the next generation of Jedi, she’s destined for great things while she’s training with her new master Luke Skywalker. With the Deluxe Rey Girls Costume, turn a young Jedi into this incredible new weapon against the Sith for Halloween! This outfit will surely outlast us all! The Princess Leia Slave Womens Costume is a titillating outfit great for adult-themed events. The Hutt crime lord Jabba forces Leia’s embarrassing look on her in Episode VI before Luke manages to rescue her, and has become an iconic look in pop-culture. Family Guy, World of Warcraft, Dancing with the Stars, and even Friends have all featured the outfit. The original hero of Star Wars! The Deluxe Luke Skywalker Kids Costume is based on the young Jedi’s look during his life on Tatooine. Perfect for classic fans of the original trilogy, this outfit goes well with a lightsaber, and is a look anybody will be able to recognize. The Jedi are the famous protectors, warriors, and peacekeepers of the galaxy. Anyone can join their storied ranks for Halloween! With the Standard Jedi Adult Robe Costume, it’s possible to turn any number of outfits into an original Jedi costume. You can also create an Obi-Wan, Qui-Gon, or Anakin outfit! A new villain has appeared! Kylo Ren’s powerful performance in Episode VII has made him the new Sith warrior for Halloween! While Darth Vader will never die, the Deluxe Kylo Ren Kids Costume is ready to make waves as the new cloaked and masked costume for Star Wars fans in 2016! Thanks for reading about the 2016 costumes! We hope your Halloween end up fantastic. Come back next week for more fun fan information. Finally, don’t forget to enter our official sweepstakes! A few times in the past, we’ve pitted Star Wars character from different eras against each other, investigating who would emerge victorious. We’ve had Han and Chewie against the Fetts, Mace Windu against Darth Maul, and more, and now we have a collection of new characters to pick and choose from. Now, for your enjoyment, we present the battle of Rey and Kylo Ren against Darth Vader and Luke Skywalker. At first it seems like a very one-sided battle. Darth Vader, the most powerful Jedi ever, and one of the few to ever beat him, Luke Skywalker, against an upstart Sith and a nameless Jedi? Might as well just end the blog post here. So, to make it a little more fair, we’re going to say Luke is Episode IV Luke, with little training and just the barest notion of what the Jedi and Sith even are. Let’s look at each character, what their strengths and weaknesses are, and how the battle might end up going. Strengths – Rey Nolastname is a dark horse in this fight. Though she clearly has the powers of the Jedi, and was even able to beat Kylo Ren in a fight, Rey is untrained and unsure of her own abilities. She can shoot, handle a lightsaber, use minor force abilities, and has a definite willpower. She is also a talented mechanic. Weaknesses – With no training of any kind, physical or mental, she is at a huge disadvantaged with juggernaut Vader on the field. Getting into a straight duel would spell the end for her. Strengths – We just said Rey beat him, but there is a caveat. Earlier, Chewbacca shoots Kylo Ren with his Wookiee bowcaster, a weapon powerful enough to disembowel at a distance. Not only does he survive the blow, but he then fights Finn and Rey in the climactic battle. Clearly, the man has more physical power than he gets credit for. He’s also talented with his lightsaber, well-versed in the force, and ruthless. Weaknesses – As the heartbreaking bridge scene tells us, Kylo Ren is wracked with guilt and unsure if he should really be playing his part as Sith Lord. He also can sometimes lose focus, as well as losing control when his anger gets the best of him. Strengths – Power, armor, lightsaber skills, force mastery. Weaknesses – despite his imposing size and strength, he is a hurt man. Striking his life-support systems could put him out of commission, and a long, drawn-out battle would tire him. Finally, if somebody can reach the emotional side he’s hidden deep within it may stun him. Strengths – Luke is a talented pilot, and engineer. He also has his ligthsaber in hand, is a good shot, and has a deep connection to the force. He also has youthful pluck in spades. Weaknesses – Not very well-trained, not very strong, and without the quiet intensity Rey has, Luke is a huge handcuff for Vader in a two-on-two. Of the four, Kylo is the most likely to rush into battle. The question is would he go after Luke or Vader? The point seems moot, since Vader would probably leap to Luke’s defense. Either way, the two battles would be Kylo against Vader and Luke against Rey. Luke and Rey, both beginning their Jedi lives, would likely take things slow. However, Rey seems more aggressive of the two, as well as having even more natural abilities than Luke. The close-quarters battle we see at the end of Episode VII gives credence to the thought Rey will quickly overpower Luke, leading to her victory. Kylo might catch Vader off-guard, but his skill is no match for Vader’s experience, as well as the incredible power Vader possesses naturally. His armor also provides him more. It’s more of a toss-up than Rey and Luke, but still trends in Vader’s favor. With Rey and Darth Vader left, victory all but seems certain of the original trilogy villain. If Vader teases and tests her, as he did with Luke at the end of Episode V, she may find an opening and poke through, but most of the time Vader will emerge victorious. Thanks for reading! Come back next week for more fun fan information. Also, don’t forget to enter our Halloween sweepstakes!